Cheesy Bacon Ranch Pull Apart Bread - Simply Addicting!! 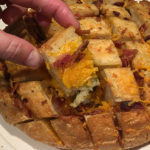 Cheesy Bacon Ranch Pull Apart Bread – Simply Addicting!! 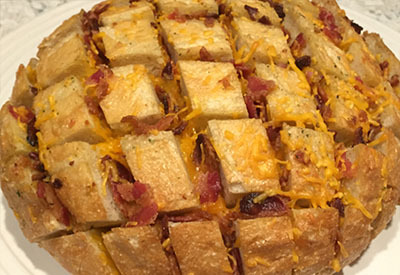 Cheesy bacon ranch pull apart bread – all the goodness wrapped up in one appetizer! Once in a while you have to put your healthy eating habits slip aside and have a cheat meal. This recipe is well worth the guilt that you might feel after consuming the entire loaf. Cheesy bacon ranch pull apart bread. The perfect party time appetizer! Pull apart bread continues to be a hot trend. It is basically a loaf of hard crusted bread that is cut diagonally in both directions and filled with flavored butter, cheese and protein! It’s easy to make and you can stuff the bread with whatever you like. 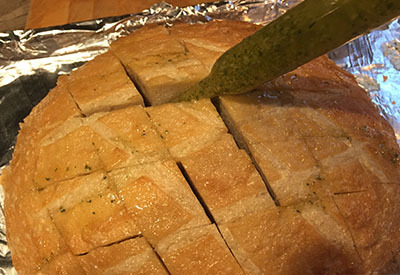 Cut the loaf diagonally in a criss cross pattern. My first attempt at pull apart bread was classic cheesy garlic bread. I made it on Spaghetti night and there wasn’t a piece left! It was easy to pull apart and because the pieces are cut into smaller bites, I didn’t feel guilty about going back for seconds, or thirds. However cheesy bacon ranch pull apart bread is my absolute favorite! There isn’t anything that combines cheese, bacon and ranch that I don’t like! It makes a great appetizer for a party and everyone loves the convenience of it being a finger food. An added bonus, clean up is a breeze! I find it easiest to use a baster to get the butter between the rows. Fair warning – if you are serving it for a party, you might as well make two because they will be gone fast! Check out the recipe below and let me know what you think! To receive our 3 Recipe Articles in your inbox each week, sign up for our free email list. You can also follow us on Facebook, Twitter, Pinterest, and Instagram. This article may contain affiliate links. Chunks of bread drizzled with butter, ranch dressing mix and bacon and then coated in cheese. A quick and easy appetizer that is a true crowd pleaser! 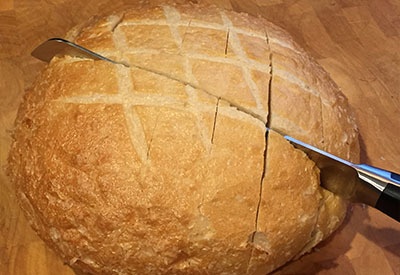 Using a serrated knife, slice the bread diagonally in one direction about 1 inch apart. Be sure to slice almost all the way down to the bottom of the loaf but not all the way through. Slice the bread in the opposite direction using the same technique. Place loaf on a foil lined cookie sheet. In a small bowl, combine melted butter and ranch dressing mix and stir. Drizzle melted butter mix between each of the sections, making sure to get in-between each one. Evenly distribute the chopped bacon and cheese between each of the sections. Loosely cover bread with foil. Bake for 15 minutes. Remove foil and bake for an additional 5 minutes.